When we left San Francisco, Gigi had just finished the 2nd grade. Out of around 80 children in her grade, she was the only one with glasses. "Perfectly normal," you say, since she was only 7 years old. But then we arrived in Paris, and out of 19 eight-year olds in her class, 3 of them wore glasses -- and had for several years. This was not an anomaly. 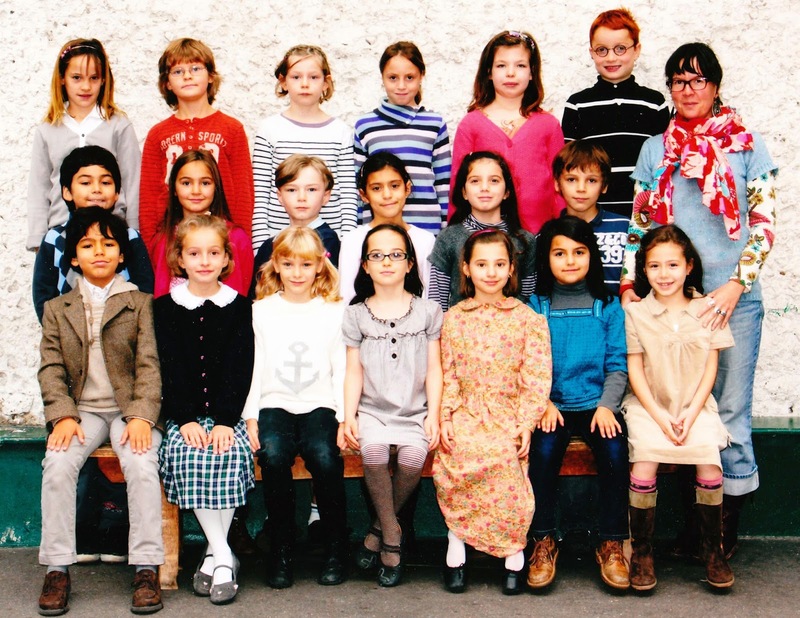 In France, more children wear glasses from an earlier age. The difference is really astonishing. And it's not a fluke. 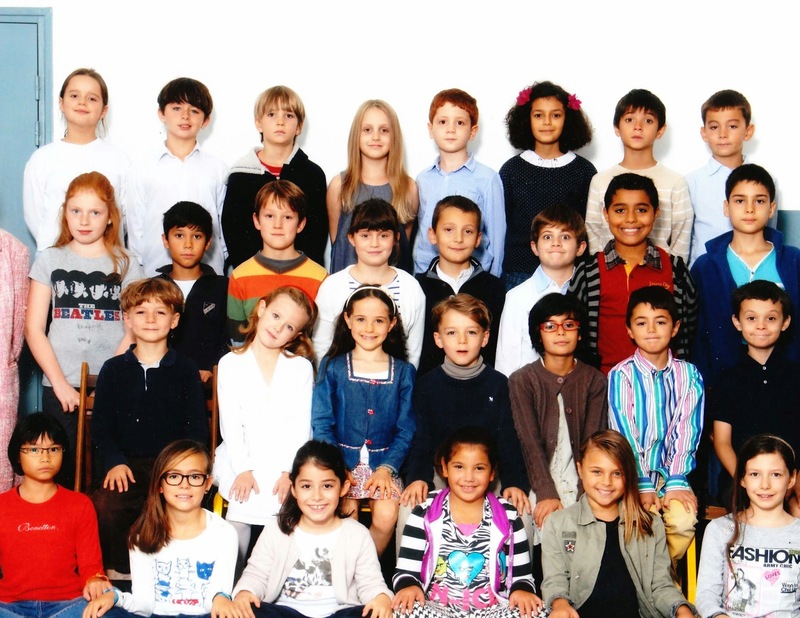 Two of Pippa's Parisian class photos, which have no repeat children in them (except Pippa herself, who doesn't wear glasses), show that 3 out of 29 and 3 out of 20 children are wearing glasses. The group of 20 kids are 4-6 years old. Frankly, some of the other kids wear glasses for reading or seeing the board but just didn't need them for the photo. In an (admittedly) brief glance at some official statistics, I am having a really hard time finding the number of children who wear glasses in both the US and France. I can find all sorts of statistics about serious eye problems (blindness, serious visual impairments), but glasses are barely tracked. But I can tell you that anecdotally, the difference is marked and noticeable. 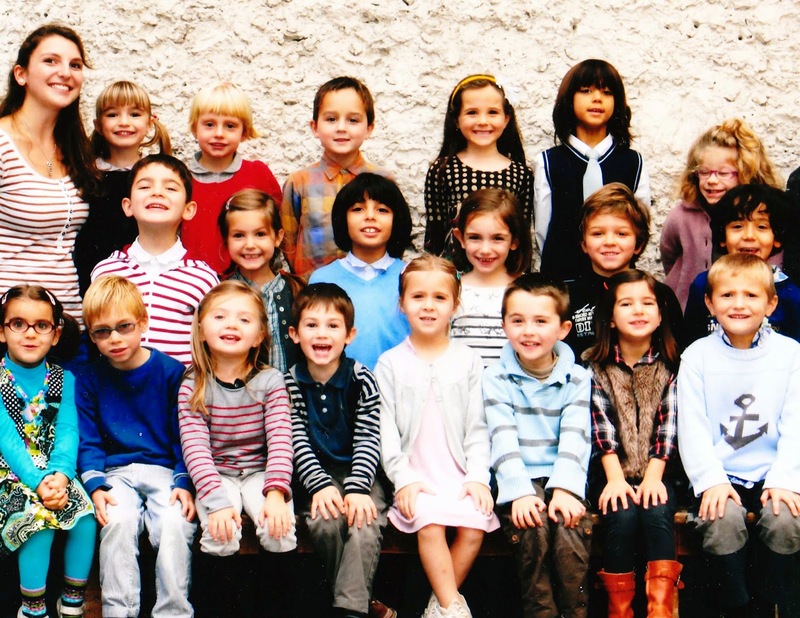 I feel like it must be on the order of 3x or 4x the number of French children wear glasses compared to Americans. Roughly a quarter of Gigi's gymnastics team wears glasses. While they're doing gymnastics. Interestingly, Gigi was excited right from the first time she needed glasses at age 4. Even before we lived in France, it's as if she was instinctively French about it: it was a fabulous accessory, one that she was allowed to choose for herself. You may notice that along with her first pair -- round, red John Lennon glasses -- she also took a pair of scissors to her own hair. I feel, 7 years after the fact, that it's my well-deserved vengeance to publish these photos. It took over a year for those diagonal bangs to grow out. She was so French (so pre-French?) 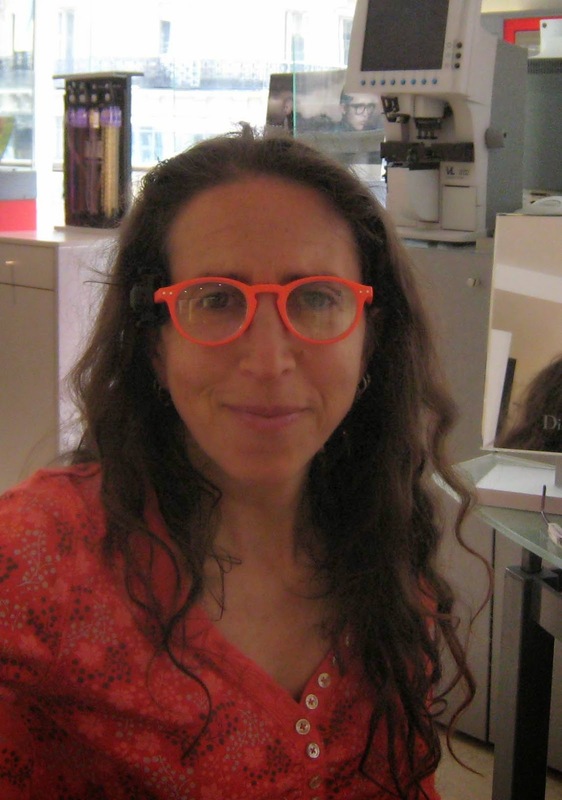 that she even chose a French brand for her first pair of glasses and most of her subsequent models as well: Lafont glasses. On our latest glasses-shopping spree, she picks out these...for funny photo purposes only, I assure you. I recently realize that I can't see things in the distance like I used to, especially in dull gray lighting (I know, that describes a lot of the weather in both Paris and San Francisco). At first, the doctor proclaims my eyesight perfect. When I protest, he tries out a corrective lens. It helps and seems to vindicate me. Begrudgingly, he gives me a prescription for glasses but says that with a .5 deviation, it is almost pointless to fill it, since they still consider it perfect vision. But I can't resist the fun of finally shopping for glasses for myself. Here are the two pairs that my personal glasses consultant, Gigi, picks out for me: the worst possible and her actual favorites. Since I really can see just fine in most circumstances without glasses, I haven't actually bothered to purchase or wear them yet. Which, really, is not very French of me. Chevrot is a raw milk cheese hails from Deux-Sèvres, which I consider the goat cheese capital of France and, by proxy, the world. The word is a play on "chevreau" which means, confusingly, both a kid goat and also a fawn (baby deer), but I assure you this cheese is goats' milk. It seems to be made exclusively by cheesemaker Sevre & Belle, who invented it. It's aged for 3 weeks in a cold cellar, resulting in a super thick, solid puck of cheese. It's got a light flavor, only slightly goaty and salty. Mostly what comes through is a hint of sweet milk and nuttiness. It's simple and simply delicious. The connection is not that two Chevrots together look like a pair of glasses, though I'm just too tempted not to show it to you anyway. It's that this particular kid -- mine, not the cheese that is -- has been wearing glasses since she was 4. Since this cheese is named after a little kid, or possibly a little deer, it seems like a good one to match with a story so close to my dear little kid's heart. Or, more accurately, her eyes.